Ripped from the pages of Dark Nights: Metal comes the Batman Who Laughs, a striking version of the Caped Crusader who makes nightmares shudder as a Pop! Vinyl Figure! The Dark Nights: Metal Batman Who Laughs Pop! Vinyl Figure - Previews Exclusive #256 features the Batman's look from the Dark Nights: Metal series. 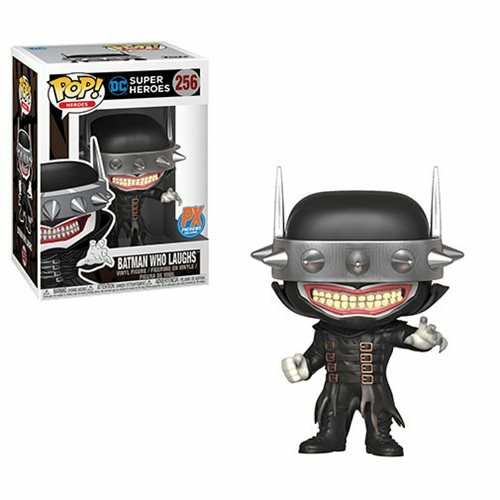 Packaged in a window display box, this Batman: Dark Nights Metal Batman Who Laughs Pop! Vinyl Figure #256 measures approximately 3 3/4-inches tall. Ages 14 and up.